Paint colors seem to be the main topic when scrolling through IG feeds. There are so many beautiful shades available today and we all seem to be very curious about how these colors appear once they go up on the walls. That's the tricky situation when it comes to choosing your new paint color and the question that comes to mind is .. how will it look on my walls? Another thing you have to be aware of is that the paint color you see in a photo may look totally different in person, especially in your home versus someone else's home. We all have different lighting situations which will absolutely make the difference in how the color will appear. The more natural light you have in your home the more the color will wash out and being on the north side of your home will change the look of the same paint color in a room on the south side of your home. You'd swear they were two different colors! Before I share my colors I'd just like to say this -- always get a sample and paint a small area. Watch the light come and go on that swatch for a few days because that is the only way to figure out if it's the perfect selection for your space. The photos I'm sharing are the truest representations of how my paint colors look in my home. You'll see how they vary a bit depending on what time of day I took the photo and even what season because of how the sun changes direction. My colors become more cool toned in the winter because of how gray and cloudy we usually are but during the summer the colors warm up a little with more of that sunny glow bouncing around the room. I will label the photos so you can see the differences. This photo was taken in the summer however, based on the color of light outside the windows, it looks as if the sun was already down. I have incandescent lighting on which also changes the look. Our family room (above) has a few different paint colors and I'll do my best describing what we have. 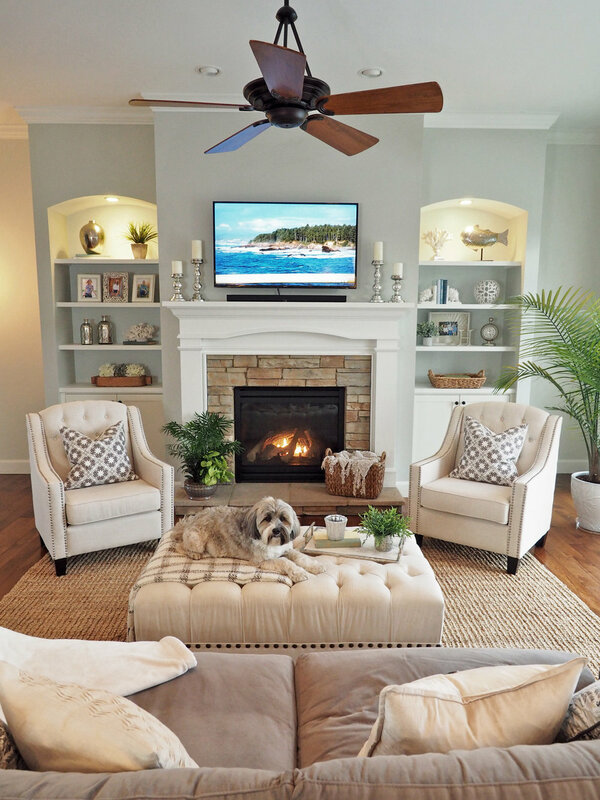 The fireplace and the built-ins are painted with Conservative Gray by Sherwin Williams. 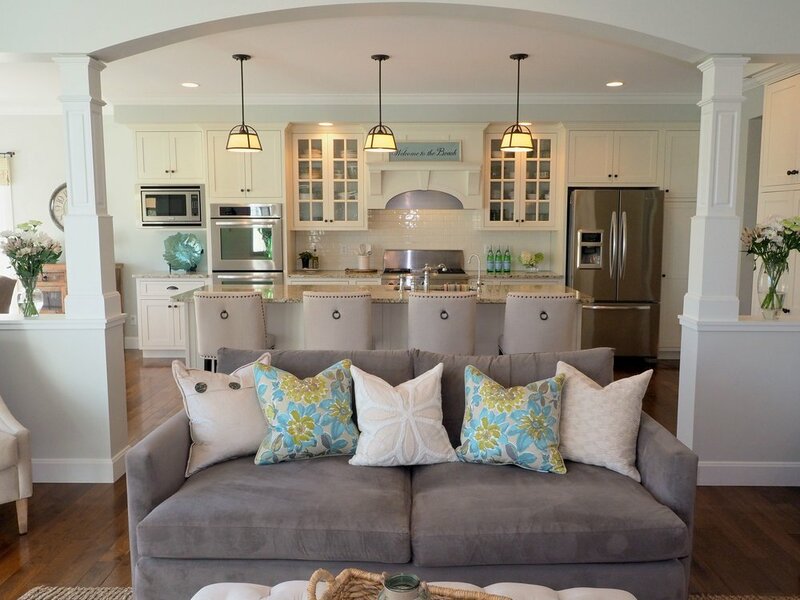 Those are the three pop-outs that you see on that wall but the back wall on either side of the built-ins is one shade lighter which is Ethereal White and all the other walls in the family room are also Ethereal White. The color that is hard to pick-up on in a photo and especially when the lights are on, would be the inside/back walls of the shelving units. They are painted Topsail by Sherwin Williams. It's very subtle but I wanted something a little bit different as the backdrop behind all the shelf decor. That color is probably only visible on close-ups of the shelves. The color Conservative Gray is a pale gray with blue/green undertones. Sometimes it appears more green and other times more blue. Again, it just depends on the lighting situation. Topsail is a pale blue with a slight hint of green which keeps it from being a true baby blue color. This photo was taken in the middle of the day on a sunny afternoon during the summer. The warmer sun outside coming into the house (but not directly,) is allowing the undertones of these two paint colors to really pop. A definite blue/green is making an appearance! This photo shows the color painted inside the shelving which is Sherwin Williams, Topsail. The family room photo above shows the two colors or better yet, the two shades of paint in our family room. I will say this, the difference is slight but that's ok, I didn't want anything drastic. My painter has said that on a Sherwin Williams paint chip card, two colors right next to each other will not show much variation on the walls. I decided to give it a try anyway and I'm glad I did! Most of the time they look a little different but it appears as lighting or shadowing and I love that! This photo is the perfect example of the seasonal changes! I took this on a gray winter's day with clouds and a light dusting of snow on the ground. Look how different the Conservative Gray appears on the fireplace and shelving walls. It is a deeper gray/blue/green as compared to the daytime summer photo. And now to really confuse the heck out of you, we also have Conservative Gray in our kitchen and breakfast room and because of the difference of lighting in those two areas, it again appears to look totally different in comparison to the family room! Is your head spinning yet?! lol Check it out below! Conservative Gray on a sunny summer day with green undertones showing. 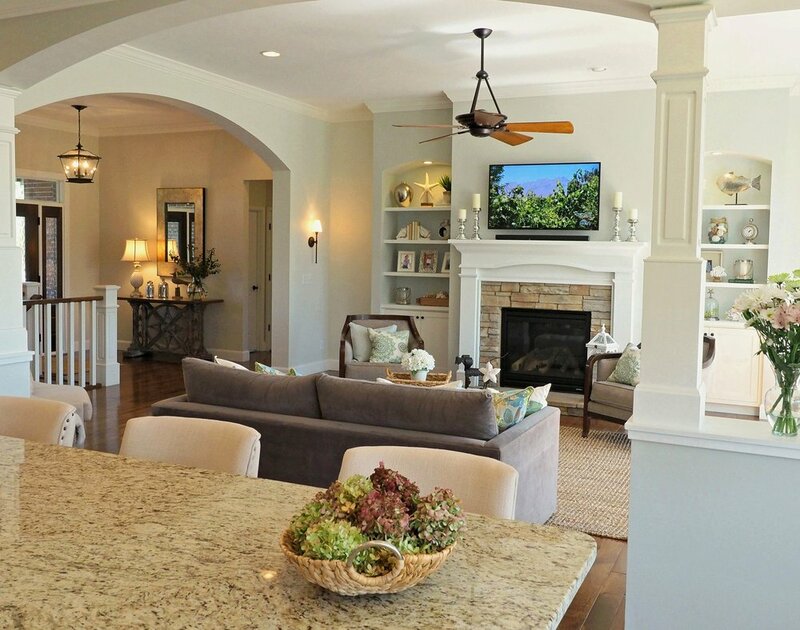 The photo above of the breakfast room shows Conservative Gray with more of the green undertones. This photo was taken the same day as the family room summer photo. Much more green, less blue. This photo was taken on a cloudy winter day, the same day as the winter family room photo. Blue/gray once again. Winter definitely cools off our paint colors! Back to sunny summer! Here you see Conservative Gray in the kitchen above the cabinets and again I'm seeing more of a pale green from warm sunny light filtering in through the breakfast room windows. 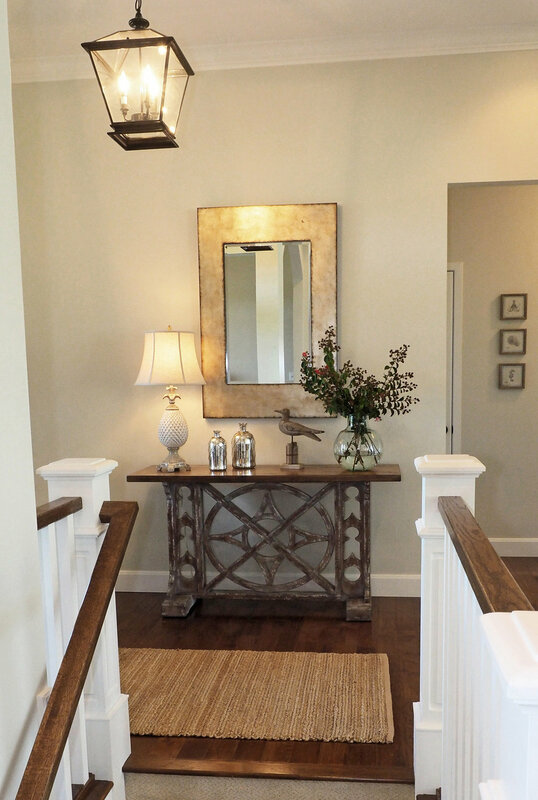 The other areas that look totally different from day to night are our hallways and foyer. Take a look! The paint color in our foyer, hallways and stairwell to the basement is November Rain by Benjamin Moore. First of all, this is a very light color. It is gray/beige (as some say greige) with a subtle green undertone. During the daytime it looks like this but at night when the can lights shine down it takes on a whole new look! The can lights are creating a lot of the drama in the nighttime photo below however, this color does something special once daylight has faded away. Nighttime view of hallway and stairwell. See what I mean? Look at the end of the hallway where the chest is and look up toward the ceiling above the mirrors. That shows you how much this color darkens up at nighttime and gives such a moody feel to the space. It makes you forget how light the color actually is! This is a good one in my book! I've been so happy with this color selection since we had it painted last year. The can lighting washes it out over the stairwell but when those lights are off it is very cozy in here. Also in this photo I have the one wall from the formal dining room that crosses into the hallway right where the ceiling height changes and that is another paint color! I couldn't make this easy and just have one paint color running throughout our entire house could I? No way!! 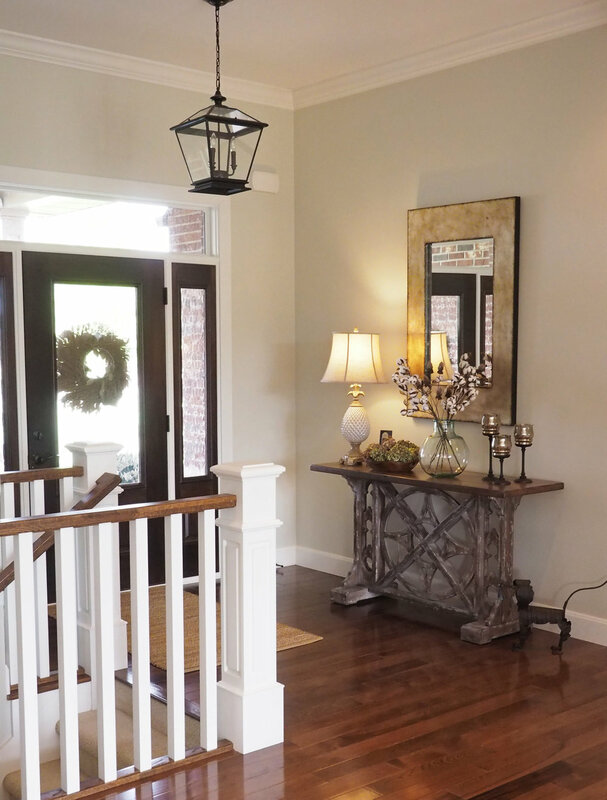 Another daytime view of the foyer paint color, November Rain by Benjamin Moore. And now for the formal dining room which is painted Ocean Pearl by Behr. It is a very light gray/green with a warm undertone. 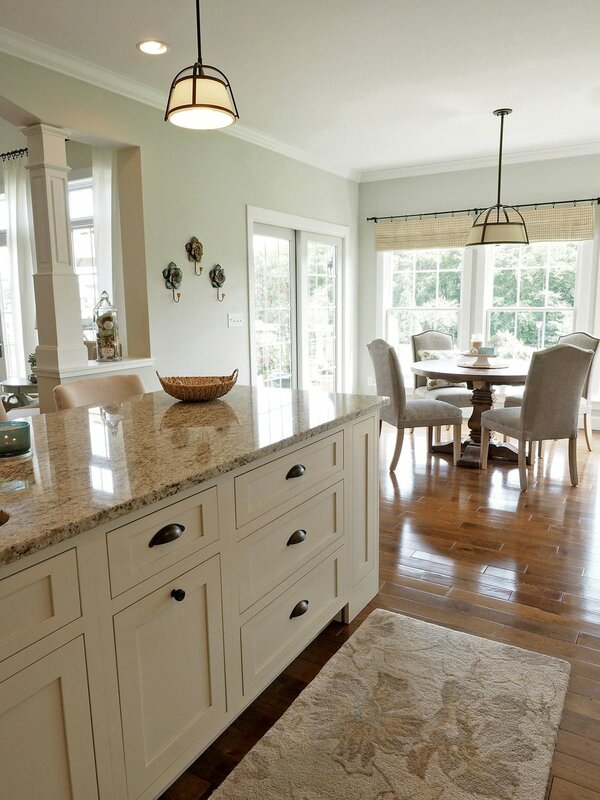 I love this color for the dining room because even though it is still a pale color, it adds just enough depth to this room creating a warm cozy space to share special meals with friends and family. It is also a great color for my somewhat coastal decor theme running throughout our home. The day I took this photo had the perfect type of lighting for this paint color. This is a very true representation of Ocean Pearl. Ocean Pearl by Behr - Another view but toward the bottom of the wall you can see how the light from the window is washing out the color. Above the curtain rod is the better place to look for viewing the actual paint color in this particular photo.